Ring saw blade is laser welded type, normally, the diameter is 14 inches. 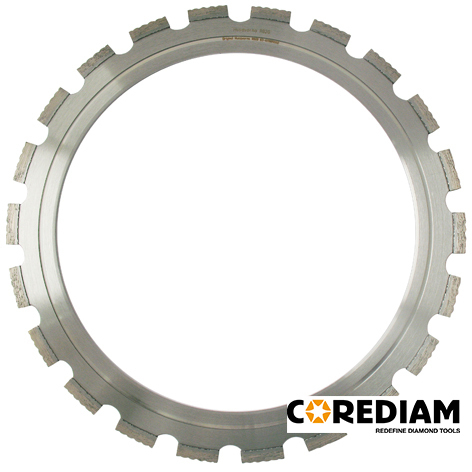 Laser welded ring saw blades are designed for cutting in all kinds of construction materials, from bricks, concrete to reinforced concrete. Diamond laser ring saw blade can be used for cutting small openings and adjusting windows and door opending, also you can use diamond ring saw blades for pipe cutting in installation jobs. We can also supply other types of Construction Tools. The Circular Saw Blade is for your reference. Looking for ideal 14 Inch Ring Saw Blade Manufacturer & supplier ? We have a wide selection at great prices to help you get creative. All the Ring Saw Blade in 14 Inch are quality guaranteed. We are China Origin Factory of Concrete Rind Cutting Saw. If you have any question, please feel free to contact us.